Growing King Oyster mushrooms on coffee grounds is becoming quite the trend and it is as easy as baking a cake. All you need is the used/spent coffee grounds, a growing bag, microwave oven and some mushroom spawn. If you choose not to use a microwave, a pressure cooker will do. Please note that this method is used for the home-grower and not for commercial growers. The fresher the coffee ground the better. If the coffee ground is old and moldy, you will need to pasteurize or sterilize it depending on your growing setup. If you don't "clean" the moldy coffee ground, you will notice a multitude of different fungi and bacteria growing on your King Oyster mycelium...this could be a very pretty sight, but most unwanted! Even though many cultivators allow contaminations, we prefer to keep them out completely. After testing many different substrates with every culture we isolate, our findings show that best ingredients for growing Oyster mushrooms are: finely chopped wheat straw, fine hardwood chips or shavings, coffee grounds (only as a supplement), bran and calcium sulphate (gypsum). Of course, there are plenty of substrates that you can use, but these are quite easy to obtain. The grow bags that we provide have our own unique filter, which allows the transfer of carbon dioxide and fresh air. 2kg of King Oyster spawn is enough to inoculate 20kgs of coffee grounds. The coffee ground should be about 65% wet/moist. If you squeeze a handful of coffee ground there should be no water dripping from your hand. Place the coffee ground inside the grow bag, flap the bag closed and microwave for 10 minutes. You can also pressure cook the bag for 1 hour. Only polypropylene bags are used. Allow to cool inside the microwave or pressure cooker. When the coffee grounds reach room temperature, you can add the 200g of spawn. If you have a heat sealer, seal the top edge of the bag. You can also roll the edge and use paper clips to secure the bag from opening. Roll the bag around in your hands so that all the spawn mixes with the coffee ground. Place the bag upright inside a cupboard and wait for two to three weeks for the mycelium to colonise the coffee grounds. When the bag is completely white from the mycelium, you can open the top of the bag and give it a mist-spray twice a day until the mushrooms begin to develop. 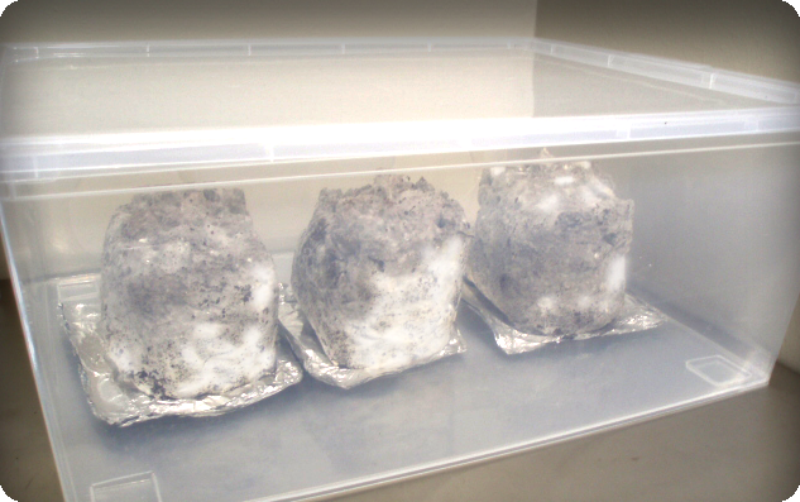 You can place the mycelium block in a plastic container to help keep moisture in and contamination out. Tip: Drill a few small holes in the bottom of the plastic container to allow carbon dioxide to escape. As mentioned above, this method is for home use only.